The FLIR ONE for iOS Thermal Imaging Camera, in combination with its free app, transforms your iPhone or iPad into a powerful thermal imager. Allowing you to see the world around you in a whole new way or just find problems around the house, FLIR ONE simply attaches to your iOS device with no additional leads, cases, devices or screens needed. 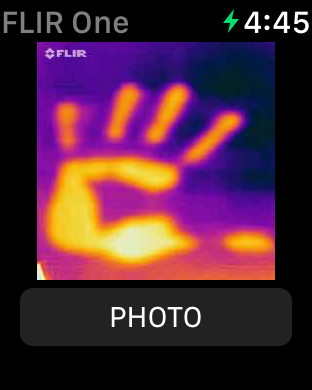 FLIR ONE works by showing you differences in heat energy, so you can detect and measure tiny changes in heat. This lets you see clearly in total darkness, find invisible energy leaks, know what’s going on outside your house at night and much more. Note: Apple's One-Year Limited Warranty does not apply to products that are not Apple-branded, even if packaged or sold with Apple products. Non-Apple-branded products may have the benefit of a manufacturer's warranty provided by the product manufacturer — please see your product box and literature for details. Benefits under the manufacturer's warranty are in addition to rights provided by consumer law. For details, click here. Why would Apple sell such a flawed product from such a flawed company? I was excited when I saw this in the Apple online store and at this price. I simply expected if Apple sells it, it must be good. I was wrong. The camera appears I was excited when I saw this in the Apple online store and at this price. I simply expected if Apple sells it, it must be good. I was wrong. The camera appears solid at first, the packaging is nice. But once you actually start using it, you’ll see the problems. The software is buggy, half the time it does not recognize the camera and the way the thermal image is displayed is flawed at best. The little temperature indicator in the mitlddle of the screen is usually far off from reality. The battery life is 20 minutes at very best. All that, I could live with, but after just over two weeks, the whole thing was dead. Wouldn’t turn on, wouldn’t even charge. What I didn’t know, I could have returned it to FLIR within the first 30 days for a full refund, but the apple website and the nonexistent packaging details won’t reveal that. A very not helpful FLIR tech support wrote that to me after the fact. If you do need a replacement (and you will sooner or later) they (FLIR) will make you print, fill out and sign, and scan pdf documents before they will even give you a return label. I’m sorry, how a company this backwards is part of Apple’s store selection is beyond me. I wish I would have known about the 30 day return policy with FLIR, I would have sent it back for sure. Is this review useful?Why would Apple sell such a flawed product from such a flawed company? The FLIR ONE app together with the FLIR ONE and FLIR ONE Pro device turns your iPhone into a thermal camera. The FLIR One and FLIR ONE Pro can help home buyers and home owners save money. Enhanced resolution through VividIR™ allows home professionals to identify problems quickly and show they’ve fixed the problem the first time. Outdoor enthusiasts and gadget geeks can see the world in a whole new way or dig into their favorite technology. FLIR ONE can get you started and the FLIR ONE Pro will take you to the next level. Its advanced image processing includes FLIR MSX®, which blends the image detail from the color camera with the thermal image to give you the best of both worlds. The revolutionary OneFit™ adjustable-height connector ensures that your FLIR ONE and FLIR ONE Pro will fit your phone or tablet, even when it’s in a compatible protective case. An improved FLIR ONE app lets you stream thermal images to your smartwatch for remote viewing and share images and videos with social media while keeping you up to date on the latest FLIR ONE tips and tricks. Explore the neighborhood, solve problems around the house, and see the world from a new perspective with the new and improved FLIR ONE and FLIR ONE Pro. Connect with the FLIR ONE at facebook.com/flir, instagram.com/flir, twitter.com/flir, and youtube.com/flir.